Whitby Town slipped out of the play-off places for just the third time this season, after falling to a second home defeat in as many games, losing 3-1 at home to Stourbridge. Chris Hardy made just a solitary change from the side that lost to Barwell, with Mikey Roberts returning from his loan spell at Guisborough Town, replacing Mark Robinson, as Hardy went to an unfamiliar 4-4-2. The Seasiders were quickest out of the blocks and got off to a dream start, just three minutes in. Adam Gell’s forward run was halted on the edge of the Stourbridge penalty area, giving Dale Hopson a chance to open proceedings from 18 yards. The Blues’ top goalscorer obliged, curling low past the visitors’ wall and Matt Gould. The 10 minutes after the break saw the game open up, and just ten minutes after the restart, the visitors were level. A long throw from Tom Tonks evaded the head of Kayelden Brown and fell to Luke Benbow, whose deft touch guided the ball across Shane Bland into the bottom corner. Across the second period, Stourbridge looked more comfortable and could have led ten minutes later. Luke Benbow received the ball from Leon Broadhurst, before turning and getting a curling shot away from 25 yards, forcing Shane Bland into a save at full-stretch. The warning signs for Hardy’s men were becoming more evident, and the visitors soon led, turning the game on its head with a freak goal. Broadhurst’s corner was headed up in the air by Brown, before dropping into a penalty area scramble and eventually finding its way over the line, via Tonks’ touch. Stour continued to go from strength to strength, and as good as sealed victory with just over ten minutes left. Whitby struggled to defend another ball into the box, with a loose ball falling to Ethan Jones, who drilled a rasping effort past Bland and into the top corner, ensuring Stourbridge’s first win in four. 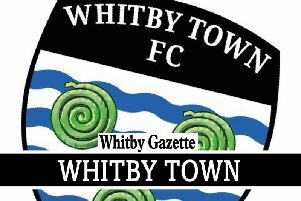 Whitby Town: Bland, Martin, McWiliams, May, Bythway, Gell, Snaith (c), Hopson, Roberts (Fryatt ’82), Tymon, Carson. Subs not used: Robinson, Dixon (GK), Hume, Weledji. Stourbridge: Gould, Knight, Westlake, Tonks (c), Preston, Pierpoint (Green ’77), Jones, Broadhurst, Benbow, Birch, Brown (Westwood ’86). Subs not used: Sho-Silva.